Michelle Yeoh is back as Yu Shu-Lien who has been given the job of protecting the legendary Green Destiny sword against an evil warlord. It’s directed by a martial arts choreography legend Woo-Ping Yuen (‘Drunken Master‘, ‘Iron Monkey‘). In the martial arts legendary category we can add star Donnie Yen (‘Ip Man 1 & 2‘ as Silent Wolf. Based on the novel, Iron Knight, Silver Vase by Wang Dulu with a script written by John Fusco (‘Marco Polo‘) with producers Harvey Weinstein, Peter Berg, Sarah Aubrey and exec producers Morten Tyldum, Ralph Winter, Anthony Wong and Bey Logan. 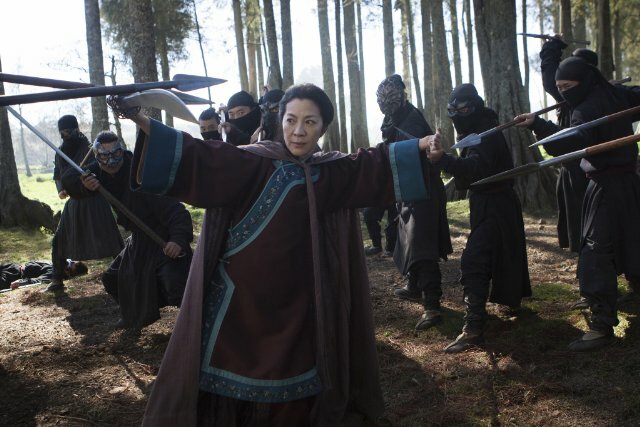 ‘Crouching Tiger, Hidden Dragon: Sword Of Destiny‘ drops to a few IMAX theaters and on Netflix on February 26. ‘Crouching Tiger, Hidden Dragon: The Green Legend’ In The Works!!! This entry was posted on Monday, December 7th, 2015 at 4:23 pm	and is filed under Books, Film, News, Television. You can follow any responses to this entry through the RSS 2.0 feed. You can skip to the end and leave a response. Pinging is currently not allowed. « ‘Game of Thrones’ Trailer Creates More Questions Than Answers!! !